Thank you for that timely reminder. I’m going next year. Fearless. This is a very self-serving blog post that reveals an incredible insensitivity to what happened in Paris and is happening in other areas. These are not isolated attacks on innocent people – they are well planned and orchestrated. It’s especially distasteful that you drew a correlation to the serious gun control issue in the U.S. Shame on you, Rick Steves. Ms. Achille, what is so “distasteful” about the presentation of facts in support of an argument? That is what intelligent writers do. The chances are far greater of being hit by lightning or being shot by s gun than being a victim of terrorism. If we feel a connection to people in Paris, including memorable employees of hotels where we have stayed, this would be a good time to reach out to them. Mes pensées vont aux parisiens aujourd’hui. Thanks for your sane words, Rick. Travel is our connection with people of other countries and cultures. To stop and isolate ourselves is to let terror win. While I agree basically with what Rick wrote, that letting fear get the best of us and thereby ceding victory to the terrorists, I don’t agree that this is just another attack like Madrid or London. No, this was different and will be a game changer. The flame of religious hatred can’t just be extinguished by traveling with impunity….this will require a global response if we are to reduce the problem. Horrifying!!! It always takes time for me to absorb any killing. But yes I think we must just stay calm if possible then think what we all can do to counter the crazy attacks. All good…and then…just had to throw out your own political agenda. Same as Newt and Rob. Nice way to sneak in the liberal anti-gun sentiment. Well put. My wife and I currently planning a trip Norway, Copenhagen (for a music festival on less) and Sweden. The events of 13 November 2015 will not change our decision to travel. Peace. We have been to Europe 10 times since 911, and not once have felt in any danger. The only problem that we feel now is the security and cancellations have become so wide spread that we put all this money down on a vacation and frankly don’t know if we are even going to get out of the US, and coming back can be so exhausting and over whelming that it kind of busts the whole good time. So for us we have to decided how much work and anxiety we want to feel dropping a ton of money and this is a vacation? Does anybody think a tour operator to Europe will advise staying home? Europe is under an invasion but the lib politicians don’t seem to care. Drastic action must be taken by the EU but too many brains have tilted so far left they’ve fallen out of their ears. A few guns in the hands of citizens where the attacks occurred could very well have stopped a lot of the killing of innocents. Disarm a country’s citizens and let them be at the mercy of Muslim terrorists? Yeah, that’s real smart, Ricky. Grow up. Personally, I agree with this. I am currently in Spain, and I was afraid to take the trains throughout Spain, but now I’ll reconsider. The truth is, if you look at the numbers, your odds of getting hit by a terrorist attack are extremely low, and I don’t think Rick in any way diminishes the pain of the people in Paris–to the contrary, actually. His citing of gun violence is simply pointing to a true reality that the US has it’s own problems of violence, so why should we fear that abroad but not fear what is in our own country? Why don’t you just move to Paris and live there. I agree. Refuse to be terrorized! Yes, these attacks may be escalating. But I think a fundamental misunderstanding on the part of the West (especially here in the US) is that armies can solve a deep-seated cultural/religious problem. We may send in armies to kill suspected enemy agents, but those groups have no such scruples—they’ll kill civilians in retaliation. There are not enough soldiers, nor enough bullets, to eliminate every human who disagrees with our ideology. Perhaps it’s time we stop the shooting and start the conversation. Well said, Rick, thank you. I’m planning a Paris trip for 2016. I believe there is no gun control issue. There are literally millions of responsible gun owners in America. A bigger issue exists in which we are ignoring societal ills that lead to deadly violence. We need to focus on mental health, opportunities for our youth and race relations. Let’s be a model for other countries instead of being called hypocrites. I just came back from my first Paris visit just two weeks ago. While the art, culture, and food are beyond belief, the best part of Paris is her people. They’re a kind, diverse, proud, hospitable and generous people. They come from a variety of cultures, ethnicities, representing a wide range of preferences, politics, religions, beliefs, etc..
And the same exact thing can be said about our US, Italy, Spain, Germany, Portugal, Japan, Iceland, Australia, etc.. We made new friends in Paris and we’ll find a way to return to her and find our way to other countries. And we’ll explore more parts of the US as well – we’ll continue to travel safe and smart. The only thing I’ll ever pack is my passport and carry on. For peace of mind and peace to all. I’m scheduled to fly there a week from today, and I have no thoughts of canceling. Why would I give that kind of win to terrorists? That’s exactly what they want? They don’t want life to return to normal. They don’t want happy people in the streets and cafes. What they want is a confrontation with like-minded individuals who are reactionary and prone to violence. They will be disappointed. Paris will return to normal very quickly, and I will help that happen. Onward to Paris in seven days. Not worried a bit. why would you fear taking the train in Spain these days. They are one of the few if only that actually do bag screenings like in an airport since the madrid attacks. as a current resident of paris but a born american i can offer the american insight to my now adopted country. for those who accuse rick of throwing in lib prop you need to relax, he was only trying to make an analogy, not the best but i get it. for those who think a “few” guns in the pockets of citizens would have stopped this, well you are sadly mistaken. odds are that person would not have been ex military or police and just a citizen who has fired at a range, just like any american. so the odds of them taking out a trained militant with a automatic weapon is really wishful thinking, remember jack bauers rarely exist. the things that need to be done in the simplest form i can give are these…. the world needs to change and sadly there are too many people who want their own version, has been that way forever and as in cycle of life it is now terrorists turn by using tech and socia media to get funding from where ever to plan these things. Thank you for your efforts to reassure your readers that “fear” should never prevent us all from traveling. I, an American am currently residing in Italy for a period of time calling it “My Adventure”. With all due respect, I believe that it is irresponsible for a Travel Adviser to indicate “I believe this is an isolated incident”. This is the SECOND attack in Paris in the same year. Just a polite suggestion if I may, might you use your very well followed informational opportunities to advise travelers to utilize registering their international travels on STEP, Smart Travel Enrollment Program. It is a free online service to allow U.S. citizens and nationals traveling abroad to enroll their trip with the nearest U.S. Embassy or Consulate. Should there be a Terrorist Alert, National Disaster Alert or any sort of Civil Unrest, the traveler would receive a notification in their e-mail. They are also able to list an emergency contact person back home in the event family back home cannot reach them. Again, my polite suggestion as you have this open window of opportunity and this service was one that I just stumbled upon and found to be so thankful for. Thank you for all your wonderful wisdom that you continue to share. May we all continue to have SAFE TRAVELS. That 30,000 a year figure includes suicides. Gun control issues in the U.S. have nothing to do with these attacks. If this event had happened in the U.S., would we be blaming gun control? Attacks can happen at any time and any place. Because of this terrible event, the security will get better, and hopefully this won’t happen again. If I was planning on going to Paris soon, I would still go. Thank you for the well thought out article. My daughter and I are planning a London/Paris visit from our home an hour away from New York City. We’ve been planning and dreaming of our once in a lifetime vacation for almost one year now. The horrific attacks of the 13th have not changed our plans. We look forward to meeting the people of Paris, exploring the sites, and savoring the food. As we say prayers for those families who lost loved ones, we will celebrate those who come together to remember that while there are those who seek to destroy, there are far more that seek to build. Tasteless blog post. Love your tours but don’t need your politics thrown into the mix. My May 2016 return to Paris trip is still a go. Thoughts and prayers out to all that have suffered during the past events. 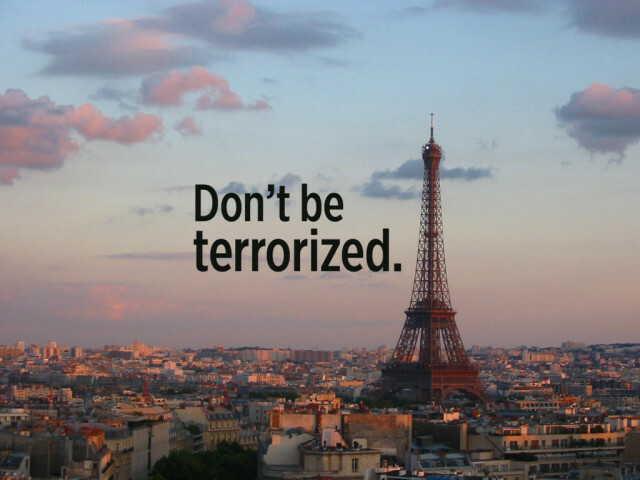 I see lots of people disagreeing with Rick Steves who were truly terrorized and have no intention of visiting Paris. Approximately 30 people are murdered every year in Paris, a city of 2.2 million people. Even adding the victims of this terrorist attack and the Charlie Hebdo attack, the murder rate in Paris in 2015 is still lower than NYC or Chicago and less than half that of Washington DC (which normally has 10 times the murder rate of Paris). The September 11, 2001 attacks did not destroy American Democracy nor Western Civilization. Neither will these attacks in Paris. I am disappointed to read some of the comments concerning RS Blog post referring to him as an instrument of the liberal left and anti-gun movement. I support everything that RS said in his blog and am glad that I was able to visit Paris in June and July this summer. I will be signing up for another European trip this month and have never given a thought of yielding to terrorists events. I also served in Korea in the US Army to help make this country free so that right-wing nan-sayers can have a chance to speak. Both my children, my son and daughter, the only two I got to show for my 40 years of life, WILL be heading to Europe in June for their first time. I refuse to make them live their lives in a bubble out of fear. I support the people of France so therefore I will keep my travel reservations. I agree with Rick, and will not be terrorized. We’ve been looking forward to our plans to visit Paris and will not cancel. Our thoughts are with the family/friends of the victims. Thank-you for your article! I teach college-level German and have a trip going to the German-speaking areas in May. Since the attacks in Paris I’ve had LOTS of people, esp. students asking me if traveling overseas is safe. I tell them GO GO GO! The chances of anything happening to a specific person at a specific time and place are actually infinitismally small. If we give in to fear, we’ve already lost. Don’t lose ANY opportunity to travel because you’re afraid of what could happen. With that philosophy we’d never set foot outside our own houses. Be careful, be aware, but NEVER be afraid. Danke! The whole point of terrorist attacks are to create fear among the people and if people are cancelling their trips to France then you’re giving them what the want! We shouldn’t be afraid! With the fighting going on in eastern Turkey, we had some concerns before leaving for our 13 day trip at the the end of August. We decided to go. We felt completely safe … and Gokalp (Alp) made it the best trip we’ve ever been on. It was the first time we’d met with a Muslim cleric, talked frankly with a Muslim family and visit serene Mosques. I think back of the wonderful people we met whenever I read the xenophobic comments of espoused by so many in the past few days. Thank you for your post, and even more for encouraging people to travel. Yes, well… Security will be heightened because NOW authorities understand that the risk is higher than they had guessed before; they are scrambling in Germany and elsewhere to tighten surveillance, borders and entrance requirements because it’s only logical that others like Abaaoud can move munitions and fellow terrorists around just as he did. The security deemed adequate in Paris clearly did not preclude this successful attack. The absence of similar attacks elsewhere does not mean authorities elsewhere have adequate security measures in place. The authorities make errors in judgment all the time (the Hannover soccer stadium that was groundlessly evacuated, for example) as terror-prevention is no exact science. I don’t see enhanced security as very comforting; unfortunately, success breeds success, and the successful attack in Paris will only prompt more such attacks. A cliche, IMO. They don’t want to scare us. Their stated goal is to take over the planet and to kill non-believers. I had just booked my flights to Paris 5 days before the attack. After hearing of the attacks and watching the nears on that Friday, I thought about whether or not to go for about 2 seconds. But I agree with others, if we change travel because of this, the terrorists win. You are SO right, Rick! My wife and I visited Italy for the third time last month and still have that wonderful glow. No evil people bent on death and destruction will inhibit us from returning to Europe. Europeans are strong, patriotic, and courageous and will do what is necessary to protect themselves and those that choose to visit their lands.